First Line: When I started research for the Trail of Thread series, my goal was to show what life was like for the thousands of women who had to prepare their families for a cross-country journey into the unknown. 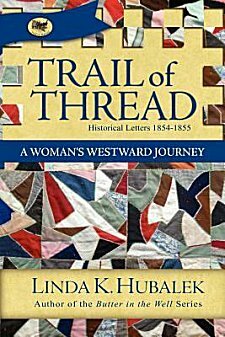 Author Linda K. Hubalek does just that in this book of historical fiction written in the form of letters by Deborah Pieratt, a woman traveling by wagon from Kentucky to Kansas in 1854. This first book in a series is based on the lives of Hubalek's own ancestors, and part of her research involved traveling the trails they did, visiting the homes they built, and viewing the rivers and streams they crossed. It is amazing how much detail Hubalek packs in her narrative, and this wealth paints a clear picture of what travel was like at the time. Deborah Pieratt had no voice in the decision to move from Kentucky to Kansas; it was a "done deal" when the menfolk in her family told her what was going to happen. In her letters back home to family members, Deborah tells us how difficult it was to pack the wagons for the journey, how heartbreaking it sometimes was to make one choice after another: should it stay or can it go? She tells of the hazards of crossing rivers and streams, of how fraught with danger stopping in towns along the way could be when the question of slavery was already in the process of ripping the country apart. If any reader has romantic notions of traveling in a covered wagon, Deborah Pieratt dispels them in her letters-- especially when talking about trying to get clothes clean and personal hygiene. Never-ending dirt and danger, uncooperative weather, trying to get meals cooked, sick children cared for, and waves of homesickness and longing for family and friends whom she would never see again-- all these things and many more comprise Deborah's journey west. Once in Kansas and finding the land they would call home, Deborah and her family have no time to rest. They immediately have to build some sort of shelter and get crops planted so they will be able to eat. Trail of Thread is a fascinating little volume that sheds so much light on this period of expansion in America. I recommend it to anyone who is interested in pioneer life and women's history, and I'll be keeping an eye peeled for other books in the series. Thank you for reviewing this, I was hopeful it might be quite good. I just checked and discovered it was pretty cheap for Kindle so I've nabbed it. Great! I think you'll really enjoy reading it, Cath. Cathy - I very much like the idea of using diaries and letters as the means for telling this kind of story. That 'personal' approach is so much more engaging I think. I'm glad you found this one enjoyable. I, too, think diaries and letters are the perfect formats for telling this sort of story-- particularly for women. Those poor souls had to have some sort of outlet for letting their hair down-- describing what they were going through, what was driving them mad, etc. !